This paper demonstrates an application of Generative Design to an urban scale through the design of a real-world residential neighborhood development project in Alkmaar, Netherlands. Problems in urban design can benefit greatly from the Generative Design framework due to their complexity and the presence of many stakeholders with various and potentially conflicting demands. 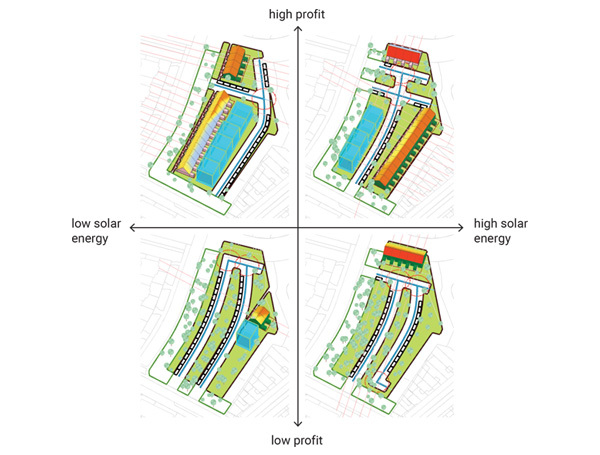 We demonstrate this potential complexity by optimizing for two important goals: the profitability of the project for the developer and the potential for energy generation of solar panels placed on the roofs of the buildings. This paper points to further research into the application of the Generative Design framework to solve design problems at an urban scale.